Summer is coming so bring on the ice cream! If someone had told me that making ice cream could be this simple I would never have believed them! This recipe was a bit of a trial run but it actually turned out really well. The best thing about this dish, aside from the fact it has peanut butter in, is that it’s really easy to make and doesn’t have any added sugar in. It’s a win, win situation really! The opportunities to add ingredients to this recipe/switch it up to change the flavour are endless as well. – Chop your bananas up, put the pieces into a sandwich bag and pop it in the freezer. 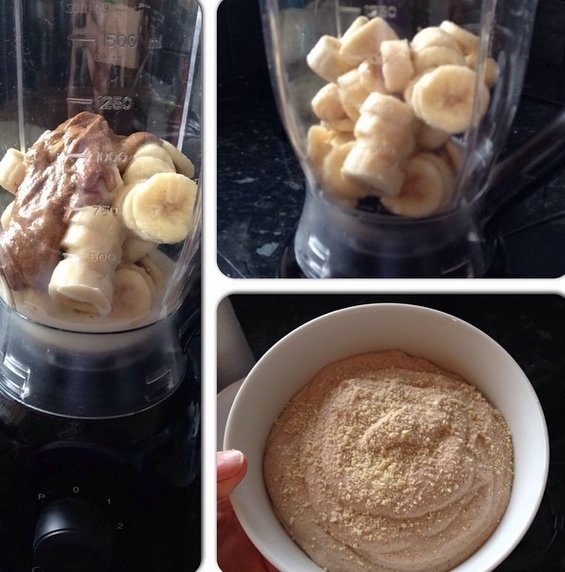 – Once the bananas have frozen put them in a food processor or smoothie maker (I used a smoothie maker and it works just as well) along with the rest of the ingredients and blitz.